My company Dutch Rentals offers several rental properties in the Mount Snow region, all at condominium associations we manage through Dutch Property Management. (Click "View all Dutch Rentals Properties") Our business right here in West Dover allows us to provide the attention to detail and the service owners and renters deserve. As year-round residents and business owners, we have the local knowledge and experience to offer options for your stay. I live, work, and raise my children right here in the Deerfield Valley, and take full advantage of its ski resorts, lakes, mountains, scenery, restaurants and recreational activities. Have stayed here before and find it perfect for our needs. Unit is clean and central to the mountain. Thank you to one of our favorite repeat customers. We appreciate your review and hope to see you back soon. Excellent location near Mount Snow with a fine view of the ski slopes. The flat is very comfortable with a nice lanai for relaxing and viewing the area. Thank you very much for staying with us and for your review. It really is a pretty view! We appreciate your business and hope to hear from you again soon. Cozy and quaint, very relaxing! We stayed here over the weekend for a music festival, Parry was very accommodating and the unit was already well stocked with dishes, etc. just a short walk to Mt. Snow, and you could see the entire mountain from our balcony. Would absolutely stay here again! My girlfriend and I had a romantic time in this cozy ski condo. The bus shuttle service to the base lodge was convenient as well. Everything including kitchen, fireplace and TV worked great! 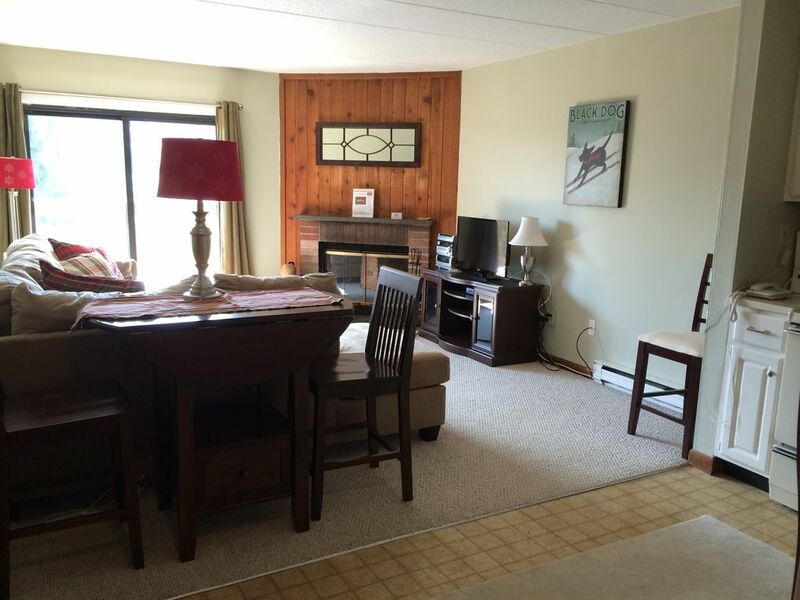 We are so pleased that this great little condo was perfect for your weekend! Thank you for sharing your review . Please come back soon. Clean and spacious with a beautiful view! My husband and I were looking for a quiet getaway for a couple of days in August. This place was located in a nice area with a great view of the mountain from the deck off the living room. Very clean and spacious and provided all the amenities we needed. Very quiet while we were there though I imagine that picks up during the fall and winter months since it is located in an ideal area for leaf peeping and skiing. Very pleased overall! Very practical and great location to resort..short walk or drive to base. Somewhat dated building from the 1970-80's but well maintained and cannot beat location. Beautiful balcony views of Mount Snow. Well stocked kitchen as i like to cook. Very quiet. I wish the facility had a gym but offers a pool/spa only. Overall a great place at a great price...highly recommend. Guests are required to either purchase a $49 damage protection insurance policy, or else place a $1000 security deposit. Notify us of your choice at time of booking. We are sorry that we cannot accept American Express Credit Cards.